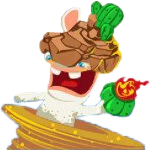 Sandy is one of two midbosses of Sherbet Desert in Mario + Rabbids Kingdom Battle. As their name suggests, they are a Rabbid fused with a dust tornado. They are fought alongside their weaker ally, Blizzy. Sandy's only actual damaging attack consists of throwing bombs, which destroy Big Blocks and inflict the Burn status on characters closest to the explosion. They can also summon a protective shield which must be destroyed before they can be attacked. If Blizzy is defeated, Sandy will continue fighting until they are defeated. Sandy normally battles at a close range, while Blizzy attacks from a distance. This page was last edited on March 2, 2019, at 14:47.